History Slam host Sean Graham with ‘Larry Walker’ at the Canadian Baseball Hall of Fame in St. Mary’s, ON. The baseball playoffs started last week, which means that it’s the time of year where stuff like this happens. Of all the professional sports, baseball has the most voluminous historiography. From questions about the game’s origins to debates over who was the best player, baseball’s history has been embraced in a way that is unique from other sports. It has been argued that the sport’s emphasis on its statistics lends itself to historical discussions – that PEDs are such a major issue in baseball when compared to the other sports is certainty evidence of how important stats are in baseball – but there’s also that Field of Dreams-esque romance that leads to a nostalgic yearning for the game’s past. 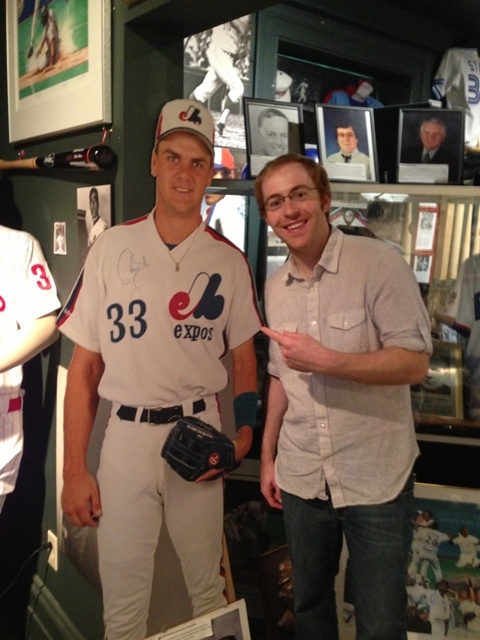 In this episode of the History Slam I talk with Scott Crawford, Director of Operations for the Canadian Baseball Hall of Fame. We chat about the Hall of Fame’s holdings and archival collections, its exhibits, and the induction process. We also have a lively discussion over who is the best Canadian player of all time and I reveal my plan for baseball’s return to Montreal. If you’re in or around St. Mary’s, Ontario, be sure to visit the Hall of Fame – it is well worth the trip!